American designers E.E. Barney and Frank Tanner patented their Ideal frontstrike typewriter in 1897. Production was started by the German sewing machine and bicycle factory Seidel & Neumann of Dresden in 1900. The Ideal A is a very bulky machine (it weighs 17 kgs) that seems to fit perfectly in a German tradition of heavy typewriters like the Kanzler. The Ideal A appeals to the eye mostly because of the elaborate decorations. Most remarkable are the cast iron side panels, with the logo molded into them. There were 4 subsequent models of the Ideal A, with different technical modifications. The A1 and A2 had very refined molded side panels, with more detailed decorations than the A3 and A4 that is shown here. Typical for all Ideal As was the carriage return handle that was not attached directly to the carriage, but was integrated in the side of the keyboard (see pics 2 and 3). This was a sensible place to put it, considering the length of the machine. In 1902 a bi-lingual version of the Ideal A appeared, called the Ideal Polyglott. This machine had the same 42 keys, but produced a total of 126 characters, which was enough to stuff it with two full alphabet sets, like Latin and Russian or Latin and Greek. 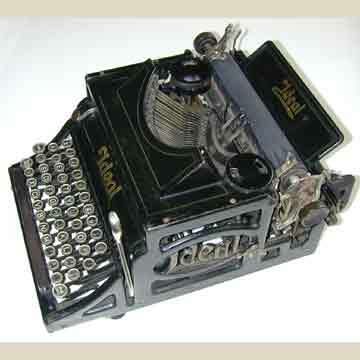 In 1913 Ideal introduced its model b, a standard 4 row upright typewriter like the Underwood. Seidel & Naumann also produced the Erika typewriter.